In 1874 the Jeffreys house at No. 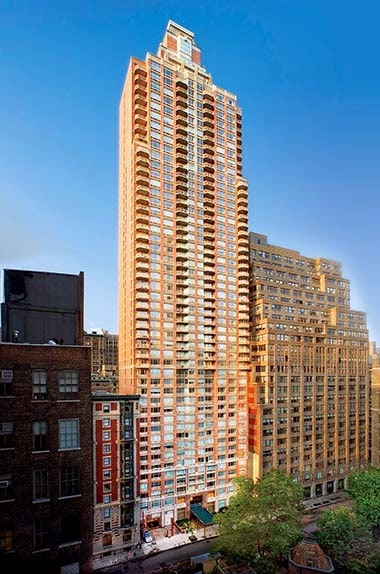 16 East 29th Street stood out among its neighbors. In the years before the outbreak of the Civil War the block had seen rapid development and the erection of high-stooped Greek Revival rowhouses. But the Jeffreys house predated these. The charming two-and-a-half story Gothic Revival structure looked as if could been have as easily been constructed of gingerbread as brick. Now the little house was squeezed in between tall townhouses. Just before 4:00 on November 10, 1874 Mrs. Jeffreys and “a lady friend” were riding in her carriage on Fifth Avenue. As they reached 47th Street, the horses were spooked and Arthur Thomas, the driver, was unable to control them. The carriage began careening down a crowded Fifth Avenue at what The New York Times deemed “a fearful rate,” terrorizing the women inside. The little house would later become home to the Irish-born physician James E. Kelly. Highly esteemed in both the medical and the Irish communities, Kelly was the guest of honor at a dinner given in January 1887. But tensions among the New York Irish ran high at the time, with factions taking opposite sides on patriotic, political and religious issues. Dr. Kelly’s dinner went on and the controversy was eventually forgotten. In 1893 he labored over a long paper on physiology. On Wednesday evening, October 18 Dr. H. R. Heydecker stopped by and Dr. Kelly gave him 40 typewritten pages to proofread and edit. Heydecker boarded the elevated train nearby at 28th Street and poured over the manuscript until he reached 59th Street. He then rolled up the papers and put them in his overcoat pocket. After exiting the train at 72nd Street he realized the manuscript was gone. Despite his expert opinion, about a dozen policemen from the Charles Street Station arrested Owen Brady, the bartender of the nearby Reilly’s saloon, and two other men, Samuel Connolly and Bob Smith. The men were charged with the murder and robbery of Cook. Dr. Kelly did not take the insult lying down. The following day the same newspaper reported that Dr. James E. Kelley had resigned “because there was too much work.” Newspaper readers knew the real reason, which was only slightly veiled by his polite explanation. 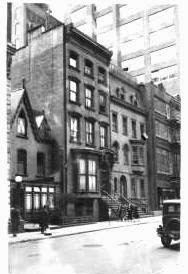 At 9:10 on the night of Sunday January 5, 1896 fire broke out in Kelly’s 29th Street house. Damages were estimated at $1,500—a significant $37,000 in today’s terms. Almost directly behind the house was St. Leo’s Roman Catholic Church. The rectory was next door to Kelly’s house, at No. 18. Now No. 16 was repaired and became the church’s parsonage, home to St. Leo’s renowned pastor, Reverend Thomas James Ducey. Crosses were erected on the points of the central gable and the dormers and it was most likely at this time that the open Gothic-style porch was enclosed as a solarium. 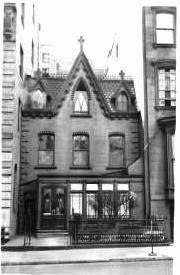 In fact, Brady had hoped that Ducey would follow him in the legal profession; but as the New-York Tribune later explained, “the call to the priesthood persisted.” But even after he was ordained, Ducey lived in Brady mansion and when the lawyer died in 1869, the priest inherited a fortune. Now Rev. Ducey moved into the quaint Gothic cottage behind St. Leo’s. He maintained a 15-acre country estate and rubbed shoulders with the wealthy businessmen, doctors and attorneys at Delmonico’s and other upscale restaurants and clubs. 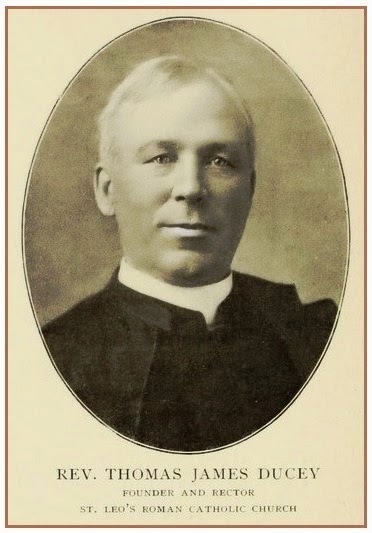 When he died at his country estate on August 22, 1909, he left his entire estate, valued at about $1.5 million by today’s standards, to St. Leo’s. By 1913 the parsonage had been converted to the Convent of Marie Repartrice. The order now owned Nos. 12 and 14 as well. On May 17 that year the Real Estate Record and Builders’ Guide noted that the Convent had commissioned work on all three structures, including new stairs and repaired masonry at a cost of $150. The architecturally-diverse group of buildings, including the little house at No. 16, survived until 1962 when the order demolished them to build a six-story structure that extended through to 28th Street. That building was replaced in 1999 by a 48-story residential high-rise.